National Distribution Centers, a division of NFI Industries, leased the 317,000-square-foot Bolingbrook Point One for its client, Trader Joe’s Neighborhood Grocery Stores. On a 41-day fast-track construction schedule, McShane Construction Company completed the first phase of improvements including the 122,000-square-foot warehouse area, the 5,000-square-foot office, a 40,000-square-foot refrigerated storage area, and refrigerated docks. McShane also installed 17 additional truck docks and added parking for both automobiles and trucks. 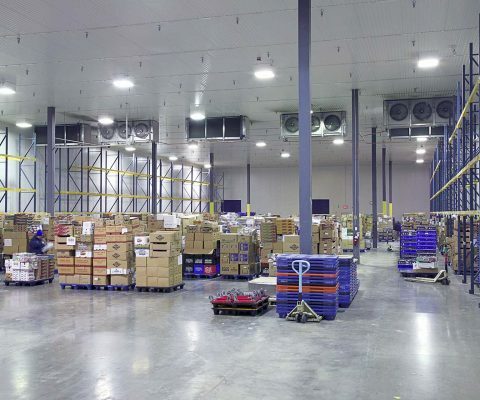 A 40,000-square-foot freezer component was also completed. Bolingbrook Point One now serves as the Midwest distribution center for dry goods, refrigerated products and frozen foods on behalf of this popular specialty grocery chain.